Since the 1990's, Moss Landing Marine Laboratories, along with scientific collaborators such as The Marine Mammal Center, have been examining the health, reproduction and ecology of harbor seals along the west coast including Tomales Bay, San Francisco Bay, and Monterey Bay. Examining the selenium and mercury concentrations in the species that cause many in central and northern California to have red coats. Assess prevalence and species of Vibrio spp. in free-ranging and stranded harbor seals off central and northern California. In addition, the team is also working on a project to determine the levels of emerging contaminants in free-ranging harbor seals from San Francisco Bay. From left, Dr. Bill Van Bonn - Dir. of Veterinary Science and Dr. Frances Gulland - Chief Scientist, both from The Marine Mammal Center, along with San Jose State graduate student Suzanne Manugian, check a radio transmitter before they implant it into the harbor seal. This harbor seal study is conducted under NMFS permit # 555-1870. The Marine Mammal Center has played an integral role in all of these studies by providing resources, sample analysis, and personnel for captures and surgeries. The Center's role has been especially pronounced in the survival study as veterinarians have been responsible for designing the surgical protocol, are performing the surgeries in the field, and also provided space and care for animals in the pilot study portion of this project. 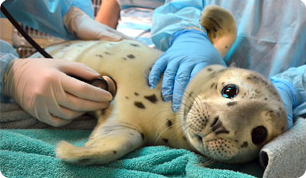 Towards the end of 2010, six free-ranging harbor seals that had the implant surgery in the field were transferred to the Center's new USDA pool for up to two weeks to assess post-op wound healing. All of the surgical sites healed without complications and these animals were released back into the wild, which paved the way to conduct surgeries in the field and immediately release animals back into the wild. While these studies do not reveal anything directly about human health, they do point out some implications about the overall health of the bay, which does impact all of us as we use the bay for recreation and food. Additionally, these studies are excellent reminders that what runs into the ocean does not simply disappear, can be assimilated into the food chain, and has the potential to affect animal health. The goal of the survival study is to determine adult female survival. While it is generally assumed that adult survival rates are high, there have not been any estimates of adult harbor seal survival in California. In the past survival studies relied on harvesting and subsequently aging animals, techniques which have inherent biases. To assess female survival, surgically implantable radio transmitters are being placed in 30 seals from San Francisco Bay (SFB) and Tomales Bay during June and July 2011. Because implanted tags are not shed from the fur during the molt, data on individual animals can be collected for 3 to 5 years. Aerial surveys will be conducted every 2 to 4 weeks post surgery to track/locate these females. The specific goals of this study are to: 1) obtain an estimate of adult female survival; 2) assess general movements of females and their faithfulness to certain areas; and 3) when possible, to investigate reproductive rate and reproductive success in these females. The selenium/red-coated seal study is building upon work that was conducted by Moss Landing Marine Labs in the late 1980s and early 1990s on harbor seals population dynamics and health in SFB. Some of the animals captured during this study had a red coloration to their coat, which may have been caused by iron accumulation on their hair that has oxidized. They also found that some of the red-coated seals had short vibrissae (whiskers), hair loss, and increased selenium concentrations in blood when compared with harbor seals from other regions. It was suggested that chronic selenium toxicity, which causes changes to keratinized tissues, may be facilitating the development of the red coat by causing damage to the hair shafts, thereby allowing iron to accumulate and oxidize. The specific goals of this study are to: 1) determine the selenium and mercury concentrations in hair from harbor seals off central California, and whether concentrations differ among locations; 2) describe and document the symptoms of red-coated harbor seals; 3) determine whether selenium may play a role in the development of a red coat; and 4) determine whether there are any potential health impacts associated with having a red coat. To achieve these goals free-ranging harbor seals are captured in three locations (Elkhorn Slough, SFB, and Tomales Bay) between 2009 and 2011, and collected hair, blood, and skin samples. To draw conclusions, scientists will look at the selenium/mercury concentrations, in conjunction with CBC/serum chemistries, histology of the skin biopsies, and the morphology of the hair shafts. The Vibrio study is focusing on potential causes of disease to harbor seals off central California, more specifically on bacteria from the genus Vibrio. Marine mammals are carriers of this bacteria, including Pacific harbor seals, however, it is unknown how the bacteria affects marine mammals. There are many virulent species, and strains can cause severe health problems across a diverse range of taxa such as coral reefs, fish, crustaceans, and humans. These marine bacteria can be acquired through ingestion of contaminated seafood or water, and can be isolated from rectal swabs of marine mammals. Goals of this study are to: 1) determine the proportion of free-ranging harbor seals off central California, and rehabilitated harbor seals from The Marine Mammal Center that carry the Vibrio bacteria; 2) investigate the effects of season and location on the prevalence of Vibrio bacteria in harbor seals; 3) determine the species and strain of Vibrio isolates and compare them with human epidemic strains; and 4) determine if any of the isolates exhibit antibiotic resistance. Data from this study will help us to understand the ecology of this bacteria, its virulence potential in marine mammals, and its zoonotic potential (risks to human health). Greig, D.J., Ylitalo, G.M., Wheeler, E.A., Boyd, D., Gulland, F.M.D., Yanagida, G.K., Harvey, J.T., and Hall, A.J.H. 2011. Geography and stage of development affect persistent organic pollutants in stranded and wild-caught harbor seal pups from central California. Science of the Total Environment 409: 3537-3547.